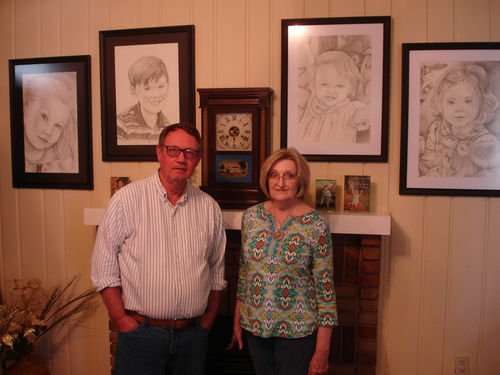 Our R-tist wood buddy requested four picture frames to house the charcoal sketches she was doing of my wood buddy and his R-tist wife grandkids. We selected Alder as it is a softer hardwood thus allowing for easier sanding. Also we were going to paint these black and wanted a smoother look without adding filler. After she selected the picture frame profile we ordered the in-stock knives from William & Hussey. This is a two knife set #2558 for wood ¾” x 1-3/8” capable of fitting on our older Shop Fox Moulder. Once we ripped the13/16” thick Alder to width we used our Grizzly 15” wide belt sander to remove the mill marks and reduce the thickness to ¾”. We set-up the Moulder and ran 120 lineal feet of ¾” x 1-3/8” Alder. To remove the knife marks the flap sander from our Grizzly G8749 Drum / Flap sander unit was used. We returned to the table saw and created a Rabbet the entire length of each 10’ section on what would become the back internal side of the picture frame. Using a Klingspor Abrasives Gold Sand Mop 1”x 4” 120 Grit in the drill press we removed the fuzz along each rabbet. The rabbet required was 3/8” x 3/8” to accommodate the glass, picture, mat, and foam backing board. This entire material sandwich had to be below the back of the Alder by 3/32” to hold the material sandwich in place when we inserted Woodworkers Supply #800-816 framer points. They were to be inserted by the Woodworkers Supply #800-815 Fletcher picture frame point driver at a later date. The next step was determining the length of the individual frame sections and cutting a 45 degree angle at each end using our Miter Saw. To make sure we had a smooth and true 45 degree angle we also used our Grizzly G1690 Miter Trimmer. The units were painted black, glass cleaned, mat set in along with the picture and finally foam board. Framer points were driven to hold the material sandwich in place. Once this was completed to keep out dust Kraft paper was taped to the rear. Finally picture wire was attached to two Heavy Duty Single Hole D Ring / Triangle Strap Hangers from Amazon. Pictures hung and Wood Buddies happy. Looks great….very nice work. I’ve got to get one of those miter trimmers. Nice work, interesting jig you have for nailing them together. Very well done on the frames and the portraits too!